UPDATE (6/3): In a surprising move, Mars Hill Ballard pastor Scott Harris alerted Phil Smidt that the church leaders had reversed themselves and will provide a severance for Smidt. UPDATE (6/1): The goal has been accomplished. In less than a day, the fund is now over half-way toward the goal of $20k. Many of those giving are former Mars Hill members and leaders. In a sense, there seems to be two Mars Hill churches, one that is run by the current executive elders and then another one in exile. Without explanation, Mars Hill Ballard’s lead pastor Scott Harris asked popular biblical living pastor Phil Smidt to step down from his staff position. Then yesterday Harris thanked Smidt for his service and told the congregation that the church was still supporting Smidt financially. Tonight, there is reason to question that claim. Smidt’s friends have set up an account on Gofundme.com to help provide financial support and health insurance for the Smidt family over a three month period. We love Pastor Phil Smidt and want to support him and his family in this time of transition since being fired from Mars Hill. Apparently, the leadership of Mars Hill declined to give Smidt transitional support after abruptly dismissing him this week (an email I sent to lead pastor Scott Harris has not been answered). Sources say Smidt declined to sign the non-disclosure agreement. Smidt’s departure comes amid other high profile staff changes (e.g., Mike Wilkerson) and dismissals of well loved lay leaders (e.g., Dalton Roraback and Phil Poirier). Roraback was dismissed for raising questions about the executive elders and Poirier was relieved of his position because he declined to sign a promise not to serve at a church in a 10 mile radius of any Mars Hill church. I wanted to let you know about a transition on our Ballard elder team. After many conversations along with much prayer and deliberation I have decided to ask Phil Smidt to step down from staff and eldership, and today is his last day. Phil has been a valuable member of the Ballard leadership team, and has contributed greatly to the counseling and marriage ministries of our entire church. We are very thankful for his many years of service. We will continue to support Phil financially and through prayer while he seeks what the Lord has next for him. Please join me in praying for him and his family as they make this transition. We will do our best to keep you informed as we seek someone to take on the Biblical Living Pastor role. In the meantime, myself, Pastor Cliff Ellis, Ballard elders along with other leaders will be taking on this responsibility. We wanted to let you know about this transition as soon as we could so that you would be prepared to discuss this with your groups as necessary. If you have any questions, I along with any of the elders would be happy to discuss this further with you. Phil Smidt is still listed as a biblical living pastor at Mars Hill Ballard campus (this page has now been removed; I have a copy of it and will put it up soon) and his wife is a deacon (link probably dead on arrival). I have heard this news from several sources but am working to confirm. According to sources, the Smidts were one of the first families to attend Mars Hill Church. Phil’s wife is the sister of former executive elder Jamie Munson. Munson is still an elder at Mars Hill and Co-President of Storyville Coffee in Seattle. Jen Smidt is a deacon at Mars Hill Ballard where she and her husband, Phil, teach regularly on marriage and dating. Together they have two sons and a daughter. They were part of the original core group when Mars Hill Church was planted in 1996. On May 24, I wrote that past members of Mars Hill Church’s Media team dispute the official explanation of the deletion of about six minutes of a recent Mark Driscoll sermon on Acts 6:1-7. After I posted the missing content, Mars Hill spokesmen told the Christian Post that the edits of Mark Driscoll discussing the mistakes of Jesus were in part due to time constraints and not unusual. Furthermore, they stood behind the deleted material. In contrast, former members of Mar Hill who once had responsibility for sermon editing tell me that such edits were not common when they were involved at the church. From another source, I can provide additional reason to question the official explanation. I have obtained notes preparing franchise campuses for weekly church services. 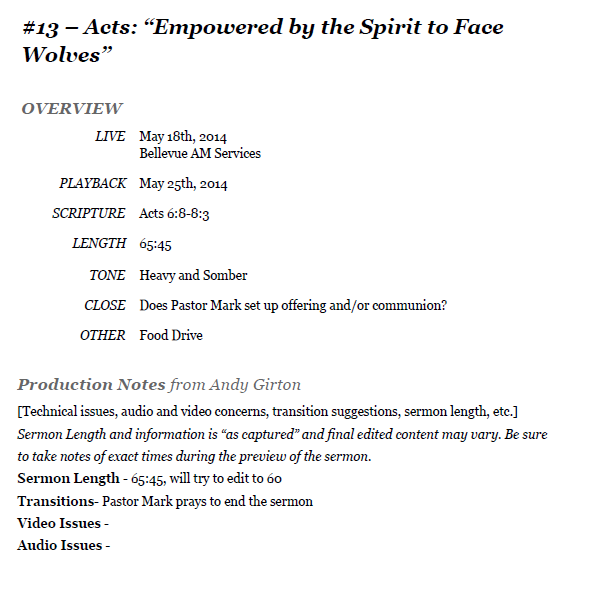 These notes list the duration of the sermon and an outline of Driscoll’s sermon points. 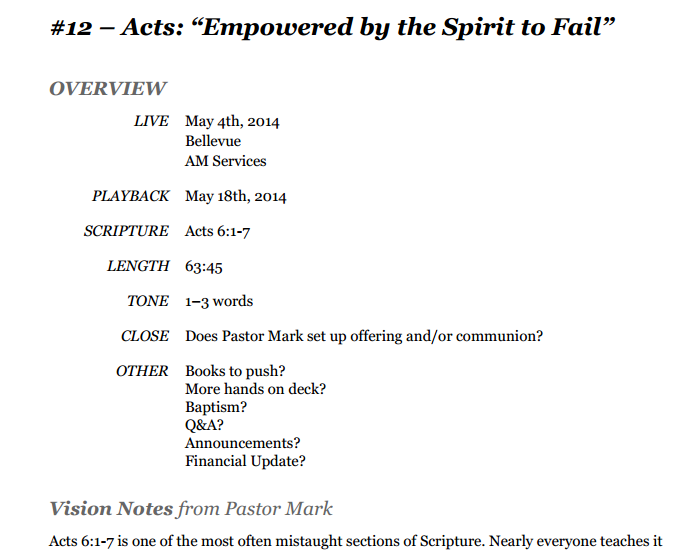 The duration listed in the notes for May 18 is about six minutes longer than the edited version of this sermon. Note the date the sermon was recorded and the scheduled date of playback. The duration of the sermon is 63:45. The version online is 56:41. In fact, the online version presentation on May 18 is much shorter than the comparable videos on May 11 (62:00) and May 25 (63:39). Clearly more was edited from the May 18 presentation than the others in the series. 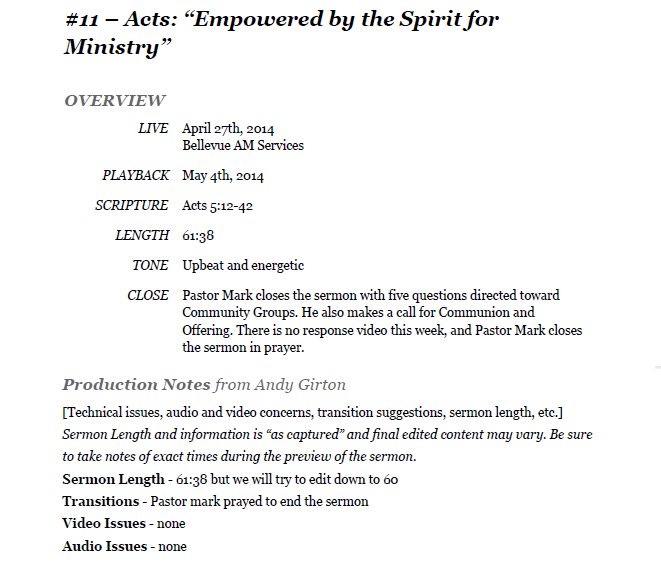 Going back to the initial sermons in the Acts series last year, the video duration when Mark Driscoll preached ranged from 66 to 73 minutes. The only one under an hour from last year is the Sunday Dave Bruskas preached. All of sermons on days Driscoll preached are over an hour. 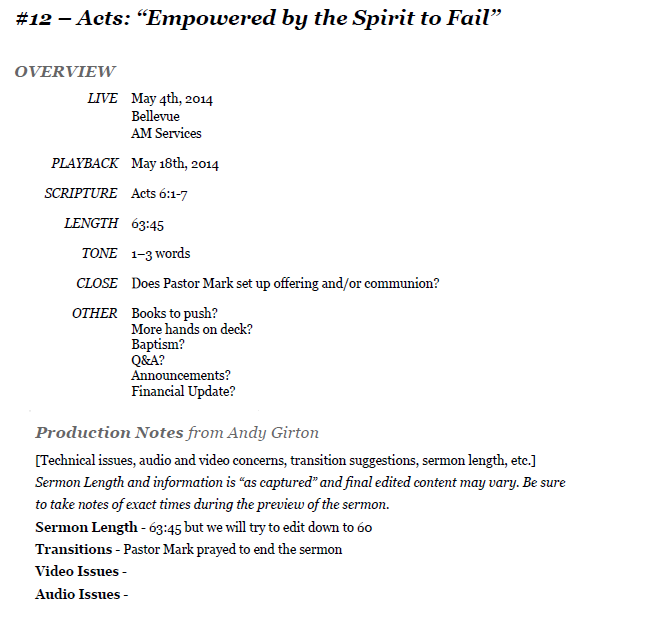 In the entire series, the only online video less than an hour on a Sunday when Mark Driscoll preached is May 18, 2014. In contrast to the claims of the church, the May 18 edits were not business as usual. I also have the presentation notes for the May 11 and May 25 sermons (click the links to view the relevant sections of the production notes). The procedure is the same for the May 18 sermon. The objective is to edit the sermon (all over 60 minutes) to about 60 minutes. This allows for the initial Mars Hill Global commercial or sermon trailer to take the online video presentation to just over an hour. The initial plan was to edit the sermon slightly to get to about 60 minutes. However, in contrast to normal practice, the May 18 sermon was edited in such a way that the message was cut to about 54 minutes in length, much shorter than any other sermon in the series. Thus, Mars Hill’s statement to the Christian Post was a half-truth. Yes, they regularly edit the sermons to get the messages to about 60 minutes. However, much more time was taken from the May 18 sermon than any other sermon in the series. If the content was really fine with the leaders then why was that particular 6 minute section removed? There were many pauses throughout the sermon were the video could easily have been trimmed to about 60 minutes without eliminating any content. After removing the Capitol Tour video from You Tube due to historical errors in May 2013, the Family Research Council again had David Barton conduct the Capitol Tour for pastors during the Watchmen on the Wall conference. According to Time Magazine, David Barton led the spiritual heritage tour and covered at least some of the same ground as in the video FRC’s V.P. Kenyn Cureton removed from You Tube in 2013. Last year, FRC told me that Barton was not going to conduct the tour in favor of Kenyn Cureton. Politico reported on Barton’s resurgence last year and he has now come full circle with FRC. Despite the fact that FRC removed the video riddled with errors and Focus on the Family attempted to cover up the fact that they also had to edit Barton’s videos to get them a little closer to accurate, Barton continues to be viewed as an expert on American history by a certain segment of the Christian right. According to Time, the conference participants talked much about taking the country back to God. Even if creating a Christian nation was possible or virtuous, one cannot expect success when the foundation of the effort is built on half-truths and error. Unless Barton has had a major change of course, those pastors are now ill-prepared to engage in intelligent dialogue with their ideological opponents. Many Christian historians would have been willing to discuss the full story with those pastors, but instead FRC chose someone the FRC and other Christian groups have admitted traffics in a faulty narrative. I am never more ashamed of my community when perceived political usefulness trumps truth and accuracy. There may be some movement on the request from 20 former Mars Hill pastors to mediate differences with current leadership (see links below). However, one of the leaders of the movement has no illusions based on recent events. Kyle Firstenberg recently provided this update on his Facebook page and gave me permission to reprint it. Many months ago, “the 20 elders” sent a letter to the Executive Elders of MHC along with the BOAA requesting mediation for the outstanding issues and unrepentant sin. It has been a slow process but there is finally movement. An outside company has been hired to mediate the issues at hand. I am hopeful that all sides can be heard, sin can be repented of and that an entire culture can be changed. Although I am hopeful, a good place to start on the MH side would be to stop firing Godly pastors who have unanswered questions. As long as they continue to sin against others, I will continue to bring that sin into the light. Does Mars Hill Really Want to Mediate With the 20 Former Pastors? The Evangelical Council for Financial Accountability is “in communication” with Mars Hill Church amid questions about the Mars Hill Global fund. The questioner informed the ECFA that Mars Hill Global has been raising money under the heading of “Mars Hill Global” but may only use a fraction of those funds for global outreach. Martin responded that ECFA is touch with Mars Hill leaders about those issues. ECFA has not responded to any of my questions regarding the standards for reporting donations made to special funds. Until recently, Mars Hill gave their donors an option to give the a fund called Mars Hill Global fund. Nearly $2.3 million was raised during the last full fiscal year. However, there is no information easily available about where those funds were disbursed. Mars Hill insiders tell me very little money goes to international outreach. However, it is not possible to check this since no reporting is available. With the changes Mars Hill has made thus far, the next step would be to post an accounting of how the money donated to that fund have been spent. Recently, Mars Hill has changed the way they collect donations. The church no longer gives donors the option of giving to the Global Fund. All donations are to be given to the General Fund or the Mars Hill Foundation. I posted this morning about the situation of Phil Poirier who was community groups pastor at Mars Hill Everett until he declined to signed the Unity of Mission agreement which is in essence a covenant not to attend a church within a 10 mile radius of a Mars Hill Church. 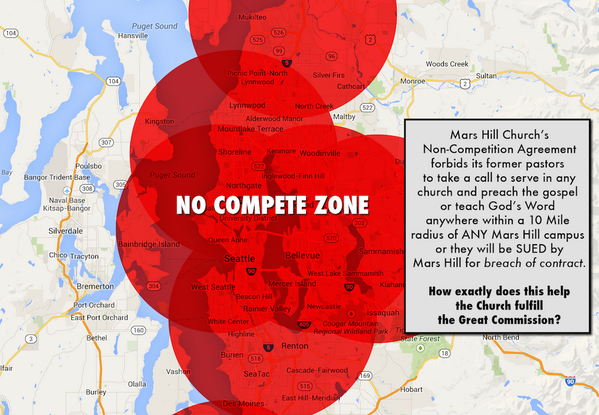 As I pointed out in a post today, since there are several Mars Hill churches in the vicinity, the noncompete zone includes about 100 miles of Western Washington. I want to inform you of a leadership transition in the CG Director role here at Mars Hill Church Everett. Phil Poirier will be transitioning from the CG Director role here at Mars Hill Everett and will be replaced by Pastor Jeff Gwin. Phil has also transitioned from the elder team. The last few months have been very difficult across the church and especially in community group ministry. Due to Phil’s personal convictions he felt that he could no longer be fully unified with the elder team. There was no sin on Phil’s behalf that have caused his disqualification in any way. As an elder there is a level of unity and trust that must be shared and Phil was no longer able to commit to that level of trust and unity. We will have our scheduled CG leader sync next Sunday, June 1st following the 12:30pm service. Please make this a priority. Pastor Jeff and I will be leading the sync and we will be asking each of you to check your hearts and commitment to the people you currently lead. If any of you do not have a commitment to the mission of Mars Hill Church, submission to leadership, a love for your groups and cannot lead with a clear conscience I ask that you would reach out to me before the sync and step away from CG leadership. I love you all very much and am deeply grieved by the transitions that have occurred. In these times there is the temptation to only focus inwardly and to become bitter over situations you do not have all the information on. I challenge you to lift you eyes, and to focus on the people the Lord has given you to care for, and to focus on Jesus’ mission in your neighborhood. We have baptized over 60 people in less than 4 months here at Mars Hill Everett, people are meeting Jesus almost weekly and lives are being transformed. This is not the time to be so focused on ourselves that we forget the needs of our people. It appears that Mars Hill is preparing to prune more people. This letter serves as an illustration of the culture of fear described by so many Mars Hill ex-staffers and members. Essentially the message is get with the program or get out. Those who are touting change at Mars Hill are working against the facts on the ground. This morning I posted the story of Phil Poirier who was an elder at Mars Hill Everett. He was asked to sign a clause in the renewal of his position as a pastor of community groups that would, if followed, forbid him from serving at a church within a ten mile radius of a Mars Hill church. He declined to sign it and was relieved of his position because of his refusal. Read more about the situation here. A couple of folks plotted the points where Mars Hill churches are located and figured out what a ten mile radius from each of the church locations looked like on a map. The first one below came from a commenter who doesn’t want to be named. The distance from North to South edges is nearly 100 miles and would take over two hours to drive. 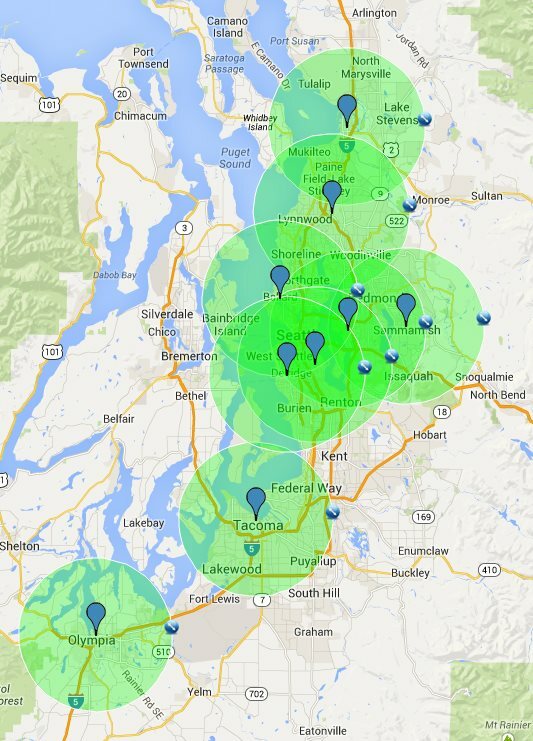 Here is another effort to illustrate the problem from Pirate Radio’s Chris Rosebrough. An Agreement between each member of the Full-Council of Elders, Executive Elders and the Board of Advisors and Accountability of Mars Hill Church. Together this day, we commit that our next church ministry will not be within ten miles of any location of Mars Hill Church, except with the express consent of the local pastors of the nearest church, the sending church, if different, and the Executive Elders of Mars Hill Church . We are, as Ephesians 4:3 says, “eager to maintain the unity of the Spirit in the bond of peace.” We care about the church, the testimony of our church, and the dear people who attend our church. We would not want our actions to cause confusion or harm by making the people of Mars Hill question our love for the Lord, the purity of our church, or their decision to worship Christ here. We acknowledge that as we adhere to this commitment, the Executive Elders and the Board of Advisors and Accountability will commit to do everything within their power to offer and support a church plant outside of the radius stated here. Soon, I will post the response to Phil Poirier’s letter from Mars Hill Everett lead pastor Ryan Williams. Williams informed his other leaders that Poirier would be “transitioning” off of the elder board. I am thankful for the years that we have had at Mars Hill. We are grateful that God led us here, and for all that we’ve learned. The abundant evidences of His grace are everywhere. We are joyful in that. My experience as an elder at Mars Hill has been challenging yet fruitful, difficult but rewarding. To serve Jesus here has been a privilege and I’ve taken that responsibility seriously, knowing that in the end I must give an account to Jesus. We have only One to please; we cannot fear man. At the end of my annual elder evaluation I was asked to agree or disagree with the Unity of Mission statement. Before God, I cannot in good conscience, and with integrity, agree with that statement. Concerning the recent events and allegations against the leadership at Mars Hill, it seems that if we are to restore trust in those we shepherd we need to start with developing trust between the Executive Elders and the Full Council of Elders. This statement seems to indicate the exact opposite. In the combined meeting we recently had with Pastors Dave and Sutton and the Everett and Shoreline elders, we were advised that the culture at Mars Hill was going to change. The culture of fear, anger, coercion and manipulation was going to be a thing of the past. While there was a glimmer of hope that this was actually happening, a statement like this one, where we are forced to agree or be dismissed, seems to be coercive. This does not reflect godly respect for one another. There appears to be a lack of trust in the Full Council of Elders. I do not believe that requiring elders to sign this statement is biblical; in fact, it appears to me as a unbiblical legalism. We all recognize the requirement in Hebrews 13:17 for the church to obey and submit to their leaders, but this passage was never intended to give license to the elders to use it as a hammer to manipulate, control or to rule out of fear and intimidation. In contrast, we have the biblical mandate in I Peter 5:3…not to be domineering over those in your charge, but being examples to the flock. I love Jesus and the people who call Mars Hill their home, so I cannot, in good conscience, resign the office of elder that God has placed me in; however, I will respectfully submit to your decision if you choose to remove me from this position. Thank you for your careful consideration of this letter. The elders did indeed remove Poirier from his position. “An Agreement between each member of the Full-Council of Elders, Executive Elders and the Board of Advisors and Accountability of Mars Hill Church. Together this day, we commit that our next church ministry will not be within ten miles of any location of Mars Hill Church. We are, as Ephesians 4:3 says, “eager to maintain the unity of the Spirit in the bond of peace.” We care about the church, the testimony of our church, and the dear people who attend our church. Poirier’s letter is interesting in that he mentions the culture of fear within Mars Hill Church. Apparently, two of the three executive elders have acknowledged that such a culture exists. However, by this action, as with Dalton Roraback, the executive elders have reinforced that fear, in essence doubling down on actions that lead to the perception that Mars Hill is an unhealthy place to hold a job. Until recently, Dalton Roraback was a coach at Mars Hill Church. Coaches provide mentoring to Community Group leaders. Community Groups provide the context for relationship building and alignment within Mars Hill. Like many Mars Hill members, Roraback had questions after hearing about the many controversies involving the church in recent months. As a long time member of MHC, Roraback knew many of the leaders and began to ask them to explain recent events. Finally, Roraback asked what turned out to be the wrong questions and found himself out of a position. He was relieved of his position because he asked questions. I want to start this off by saying I had originally decided not to go public with my story. I figured if the Elders at Mars Hill want to accuse me of being divisive then I wouldn’t add any fuel to that charge by going on the Internet and doing some kind of tell-all. I thought all that people needed to know was that I was accused of being divisive and asked to step down, and that I had submitted my resignation as a member of Mars Hill. That changed only hours later when I heard the following news. I was stunned. I had just told my Head Coach – sorry, my ex-Head Coach – that I wasn’t going to go public with my story, but the news about Pastor Phil made me realize that not to do so would be to do a disservice to the truth, to all the people like Pastor Phil, and to the many others who have been harmed, slandered, and spat out of the Mars Hill machine. So after confirming that this news was true I decided to speak out. More information about the “unity of mission” clause is coming in a future post. Essentially, it is a non-competition agreement. Enter 2014. I was now a Coach and was excited and ready to do my best to lead the three CG leaders and do whatever it was that God wished me to do. My head coach was a good, godly man and a friend. I felt like great things were going to happen, and that God was going to use us in awesome ways for His glory. And then the double-whammy of the ResultSource fiasco and Dave Kraft’s public charges against Mark Driscoll hit the fan. Now, Dave Kraft had (and has) a stellar reputation in the Mars Hill community. I had trained under him in a couple of classes back in the day, and would take him at his word – as would most of us – on just about anything. When these two events became public, I started asking questions. I had been around a long time and had no problem in being able to speak to many of the elders to whom I reached out. As I spoke with them, what I heard stunned me even more. Many of them agreed with Dave Kraft, but they also understood that they had very little power as Elders, if any, and would rather work from within to try to get true accountability in place. Some also admitted if they spoke up they would get a visit from Sutton or another Executive Elder and they would be accused of not being ‘on mission’ or not being ‘all in’, and when that happens…it means you are done as an Elder at Mars Hill. I believe we are already seeing the effects described in the Isaiah passage. People are fleeing Mars Hill by the droves every week. Tithing is down. The church is in emergency mode. In place of the old Mark who was able to lay out the Gospel with such passion, his sermons contain less about Jesus each week. Instead, we hear Mark using Scripture to make himself look like the Apostles and those who speak out against him look more like the enemies of the early church. It’s chilling to listen to, and unfortunately, I believe that many people are completely unaware that they are being manipulated with such ease. I have two questions that I’d like to humbly and respectfully submit in advance as I imagine it will require some research ahead of time. 1. What are the salaries of the Executive Elders? And if we are not allowed to know this, why not? The answers in the room from at least three people were some form of ‘because we pay their salaries with our tithes.’ The elder who was in the hot seat on this one pushed back on this response, continuing to suggest that this is not important, but when he realized the people in the room were not in agreement, he turned to another elder who got up to explain how the process of setting the Executive Elder salary worked. It was a nice speech, and it made it sound like there were multiple layers of oversight – just not from the thousands of members who pay their salaries, of course. Mars Hill members are not allowed to know something that any church with integrity should be willing to share, especially during times when the members have lost trust in the Executive Elders. So they refused to answer these questions, and it did not sit well with many in the room. Twice during this same meeting, the elder leading this meeting labeled everyone who is speaking out against Mark Driscoll and Mars Hill as people who ‘only want to hurt the gospel, the church, and Mark Driscoll’. I called him out on that in front of everyone saying that was a misrepresentation of godly people with valid concerns, but at the end of the meeting he made the characterization again. I’ve heard now from two different people that elders and leaders are visiting Community Groups personally and labeling anyone who speaks out on these concerns as ‘divisive’ and ‘only wanting to tear down the church’. In other words, wolves. Couple that with one of the latest sermons entitled ‘Empowered by the Spirit to Face Wolves,” and you get the picture. So five days later I was sitting at Starbucks with my Head Coach for an early morning meeting, and he was telling me that the elders at Mars Hill considered me divisive and were removing me as a Coach. I asked if I had sinned in some way, and he said no, they did not consider me in sin. They just thought that the way I was going about asking these questions was done with a ‘divisive spirit’. They said that I didn’t have to leave Mars Hill, and that after ‘a season’ I could petition to be a Coach again and they’d consider it. I had spent the previous three hours in prayer (I couldn’t sleep, I was pretty stressed over all of this,) and I already knew God was finally allowing me to walk away. I let him know that my wife and I wished to submit our resignation from Mars Hill, but I implored him to fight the good fight and to not simply accept everything that he was told as truth. I asked him to reach out to others and to stand up for what is right. I believe that he will come around, because he does listen to the Lord, and God has called him to lead. However, like me, it will probably take some time for the realization to take root. I pray for him whenever I can, and love him and his family very much. So questioning where tithe money goes reveals “a divisive spirit?” What does refusing to answer legitimate questions reveal? There has been some talk in recent weeks about the Board of Advisors and Accountability possibly entering a mediation process. If so, it can’t happen soon enough. Despite spiritual talk from the BOAA, it doesn’t appear that anything has changed. The executive salaries are a closely guarded secret at Mars Hill. Sources who are in a position to know have told me that Driscoll’s salary took a dramatic jump after Sutton Turner joined the executive elder board. Estimates are between $600k and $900k. Salaries are supposed to be set via a comparison to other churches of comparable size. It seems hard to fathom that some churches set salaries in a corporate manner, but this is apparently how it is done at Mars Hill. Judging from the reaction to Roraback, the leadership of Mars Hill views the subject of salaries to be a sensitive matter. For more on Mark Driscoll’s On Mission CRUT, see this article by James Duncan. Duncan lays out the procedures by which the profits from Real Marriage may make it back to the Driscolls. It seems clear that the membership of Mars Hill has not moved on from the Result Source and other events. From earlier today: Who at Mars Hill Church Authorized Church Funds to Buy a Place for Mark Driscoll’s Real Marriage on the NYT Best Seller List?